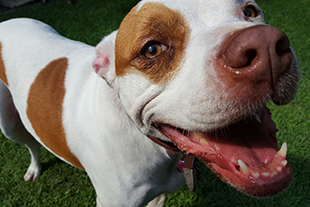 "Dolly” (pictured here) was a Bully Breed dog who opened the heart of the man who adopted her and taught him how loving, sweet and gentle these dogs can be. No different than any other type of dog. Today, in her honor, Dolly’s Dream is to give dogs like her a second chance at life and the type of home every dog deserves. See the Dolly's Dream Dogs that have been adopted. Walk through the kennels of Halifax Humane Society and many other larger animal shelters in Florida and you’ll discover quite a few dogs we lovingly call “Bully Breeds.” Big, tall, short, small they have one thing in common – a head that looks a bit “square.” Often referred as “Pit Bull” or a “bully breed”, these are simply the mixed breed dogs that are now one of the most popular and most beloved dogs in America! Dolly’s Dream is a project to encourage the adoption of our bully breeds” and to help counter the unfortunate stereotypes and myths that some people still believe about these dogs. Halifax Humane Society finds homes and new families for thousands of these dogs each year. They are adopted by a wide variety of people – single people, couples, grandparents and families with children of all ages. Each month, the Dolly’s Dream project sponsors two great dogs available for adoption at Halifax Humane Society. Dog Bed Blackwood Food 30 lb.